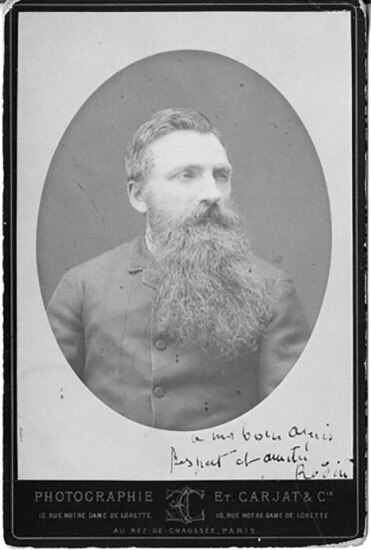 Auguste Rodin, c.1879 (Etienne Carjat & Co carte de visite, Philadelphia Museum of Art, curatorial files). In a career that spanned the late nineteenth and early twentieth centuries, Auguste Rodin (French, 1840–1917) was deeply inspired by tradition yet rebelled against its idealized forms, introducing innovative practices that paved the way for modern sculpture. He believed that art should be true to nature, a philosophy that shaped his attitudes to models and materials. Many know Rodin for the controversies surrounding certain of his works, such as the scandals around The Age of Bronze or the Monument to Honoré de Balzac, and for his unfinished projects, most famously The Gates of Hell. But few who recognize Rodin's sculptures have failed to be moved by them. His genius was to express inner truths of the human psyche, and his gaze penetrated beneath the external appearance of the world. Exploring this realm beneath the surface, Rodin developed an agile technique for rendering the extreme physical states that correspond to expressions of inner turmoil or overwhelming joy. He sculpted a universe of great passion and tragedy, a world of imagination that exceeded the mundane reality of everyday existence. 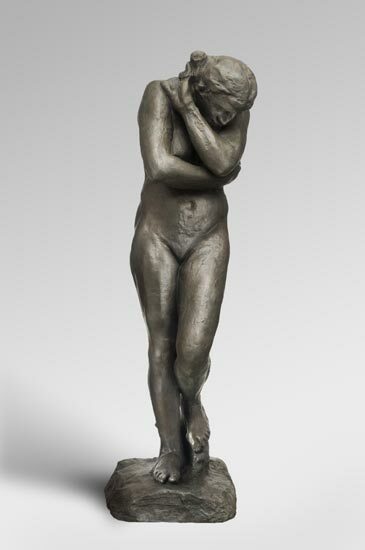 Although Rodin was not educated at the École des Beaux-Arts in Paris, the prestigious school for the training of French artists, his focus on the human form and use of various materials such as bronze, marble, plaster, and clay, illustrate his respect for sculptural tradition and his desire to work within the system for commissions and exhibition opportunities. 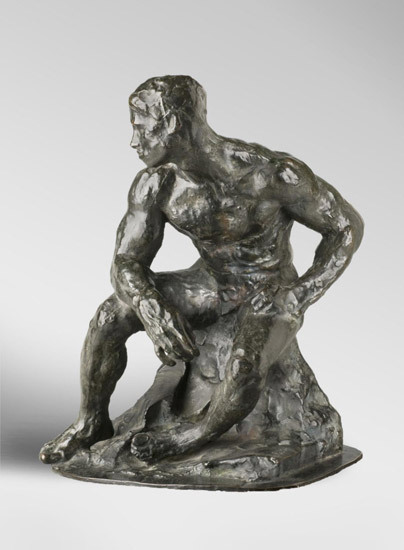 The hallmarks of Rodin's style—his affinity for the partial figure, his focus on formal qualities and relationships rather than on narrative structure, and his desire to retain the marks of the sculptural process on his finished works—were revolutionary in his time. 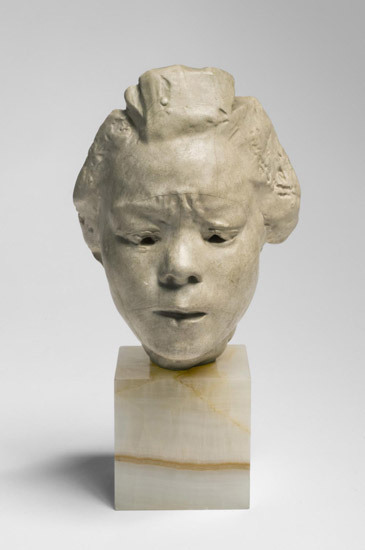 The evocative intensity of his works were elaborated on by countless artists who followed him, including many who worked in his studio, such as Constantin Brancusi (French, born Romania, 1876–1957) and Aristide Maillol (French, 1861–1944). François-Auguste-René Rodin is born in Paris on November 12 to Jean-Baptiste Rodin, a clerk with the police department, and Marie Cheffer Rodin. The family, which also included Rodin's sister Maria (born 1838), is devoutly Catholic. After his early religious schooling, Rodin attends the Petite École, a school specializing in the arts and mathematics, where he studies drawing and painting. Although a successful student at the Petite École, Rodin fails the entrance exam to the École des Beaux-Arts, the most prominent art school in France. The committee likes his drawings but the eighteenth-century manner of Rodin's sculpture fails to meet with approval. To earn money to help support his family, Rodin takes a series of jobs working for commercial decorators, learning at the same time every facet of the sculptor's craft. 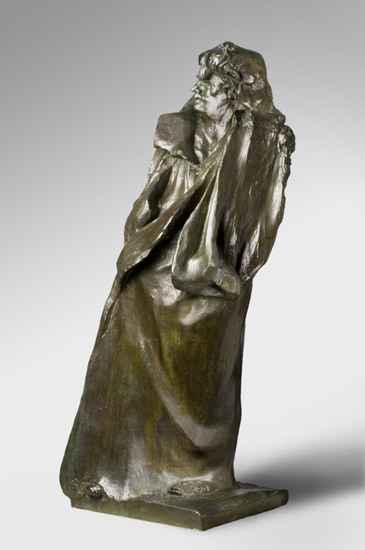 Rodin's beloved sister Maria dies and in his grief he decides to enter the order of the Society of the Blessed Sacrament. 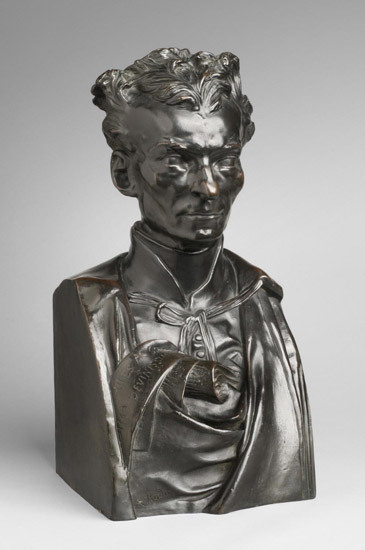 However, by the following year, the founder of the order, Father Pierre-Julien Eymard, advises Rodin to leave the order and pursue a career as a sculptor. Rodin meets Rose Beuret, a twenty-four-year-old seamstress who becomes his lifelong companion. Their stormy relationship inspires a number of the sculptor's most dramatic works. Rodin begins work in the studio of the successful sculptor Albert-Ernest Carrier-Belleuse (French, 1824–1887). 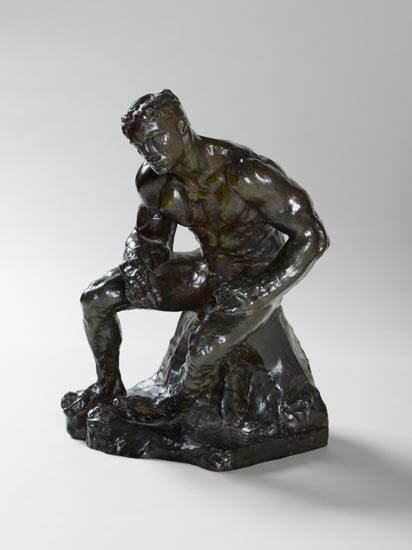 During the six years Rodin assists Carrier-Belleuse, his independent sculptural work is influenced by his employer. 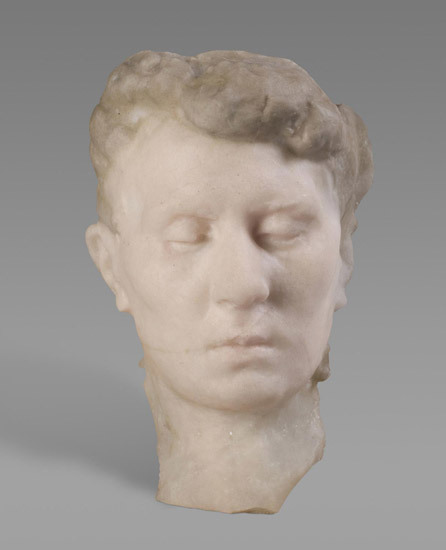 Rodin and Rose Beuret's son, Auguste-Eugène Beuret, is born on January 18. Rodin enlists in the 158th Regiment of the National Guard and attains the rank of corporal during the Franco-Prussian War, but is soon discharged for nearsightedness. Rodin joins his former employer Carrier-Belleuse in Brussels; Rose arrives the following year. In Brussels, Rodin enters a partnership with sculptor Antoine Van Rasbourg (Belgian, 1831–1902), another former employee of Carrier-Belleuse. 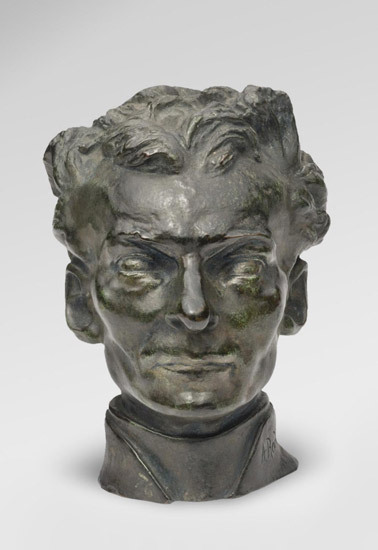 Rodin exhibits Mask of the Man with the Broken Nose at the Brussels Salon. 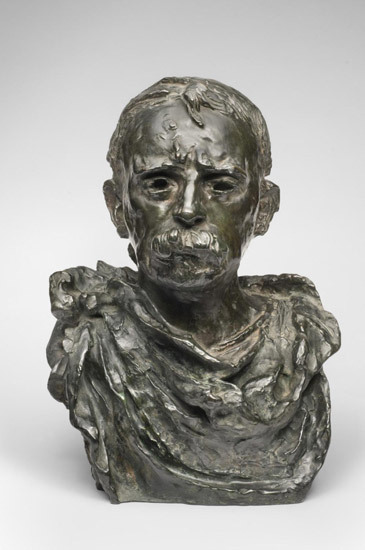 Rodin begins work on a figure that later becomes known as The Age of Bronze and exhibits a modified version of Mask of the Man with the Broken Nose in marble at the Paris Salon. Rodin visits Rome, Florence, and Naples, where he begins an in-depth study of the work and artistic principles of the Renaissance artist Michelangelo (Italian, 1475–1564). 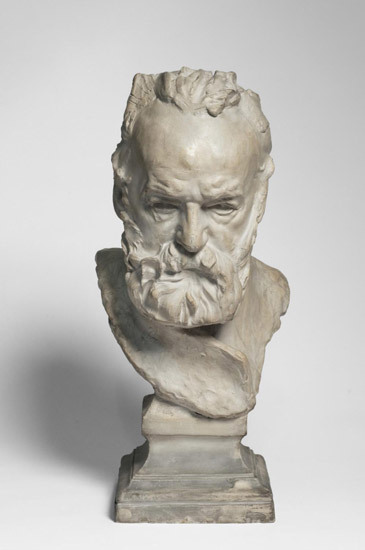 Rodin exhibits eight works in the Belgian exhibit at the Centennial Exposition in Philadelphia. 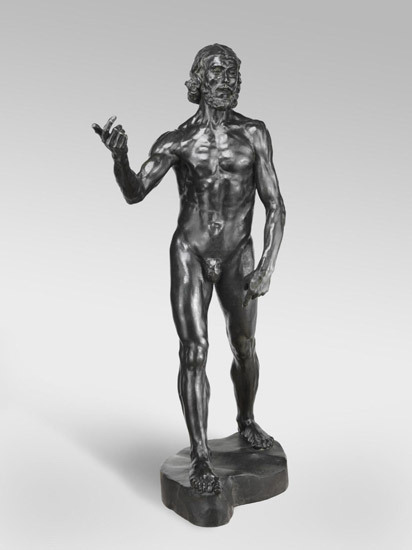 The Age of Bronze is exhibited in plaster at the Paris Salon and Rodin is accused of casting the figure from life. 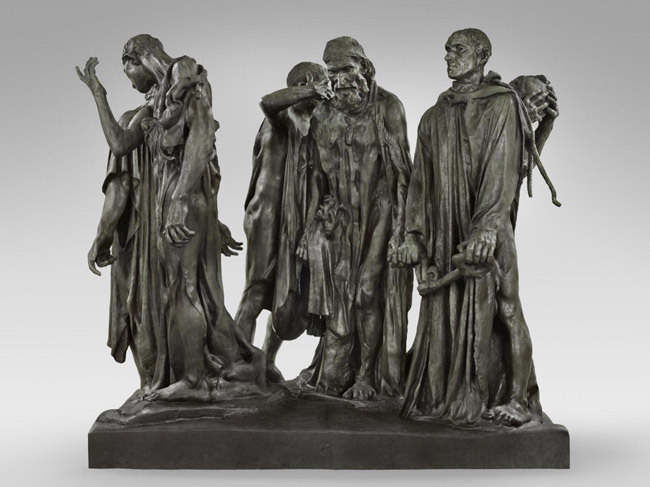 Rodin leaves Brussels and returns to Paris with Rose, where he begins the over-life-size figure Saint John the Baptist Preaching, partly in response to the charges against The Age of Bronze. 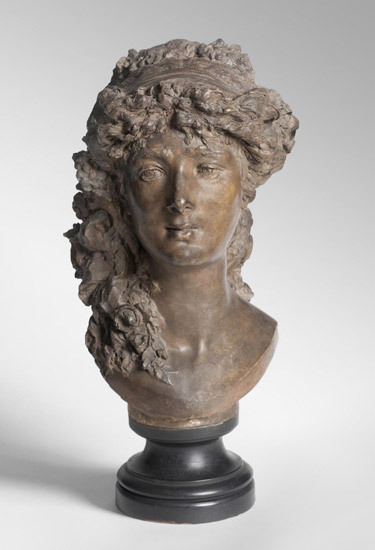 The Age of Bronze wins a bronze medal at the Paris Salon and is purchased by the French state. 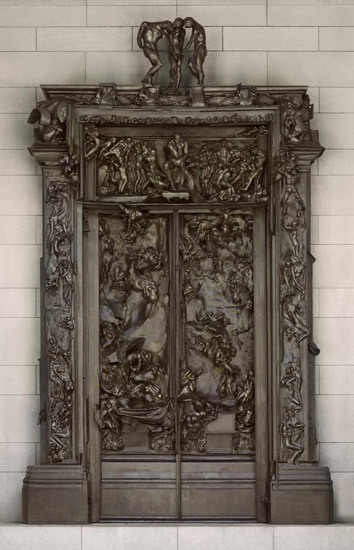 On August 16 Rodin receives a commission to create a set of bronze doors for a new museum in Paris to be devoted to the decorative arts. Although the museum never comes to fruition, the doors eventually evolve into The Gates of Hell. Rodin meets Camille Claudel (French, 1864–1943), a sculptor who becomes his student, collaborator, and lover. Rodin signs a contract to create The Burghers of Calais. It is eventually unveiled in Calais, France, in 1895. 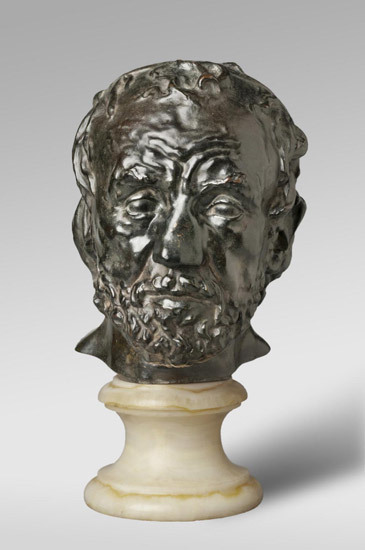 Rodin is awarded the Cross of the Chevalier of the Legion of Honor (similar to being knighted) by the French government. 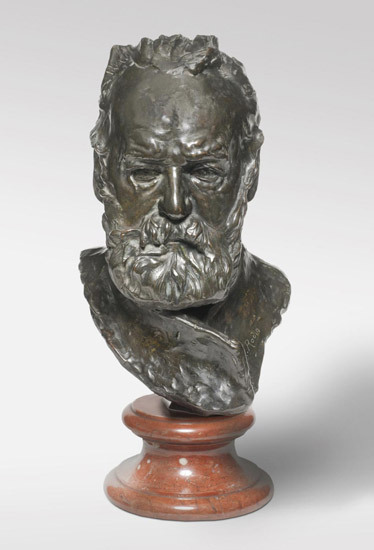 Rodin is elected a member of the committee of the Salon des Artistes Français and is a member of the jury at the Exposition Universelle. He holds a joint exhibition with the Impressionist painter Claude Monet (French, 1840–1926) at the Galerie Georges Petit in Paris. 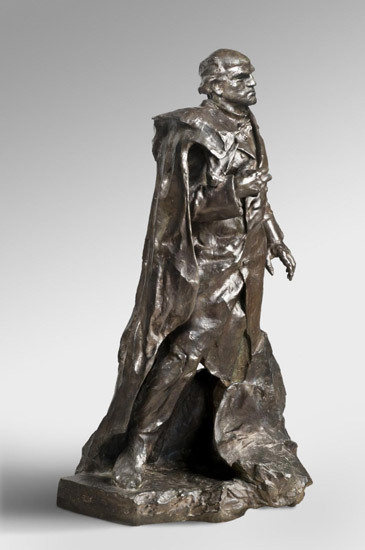 While working on a monument to the writer Victor Hugo (French, 1802–1885) originally intended for the Panthéon building in Paris, Rodin receives a commission for a monument to honor the playwright and novelist Honoré de Balzac (French, 1799–1850) from the Société des Gens de lettres de France (Society of Men of Letters of France). Rodin secures a commission to create a monument to Domingo Faustino Sarmiento, the seventh president of Argentina—an indication of his international reputation. 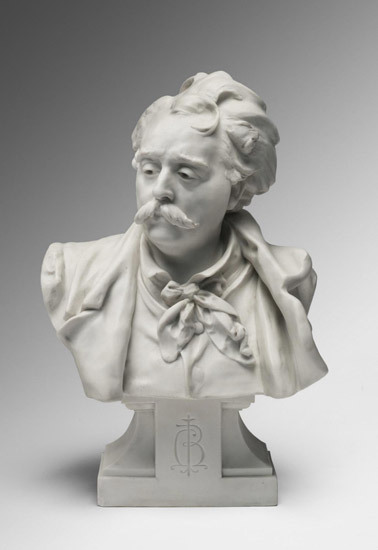 The artist also receives offers to commercially market some of his sculptures, such as Youth Triumphant and The Kiss—a reflection of his popularity. Rodin purchases a home in Meudon, a suburb of Paris, where he lives for the remainder of his life. 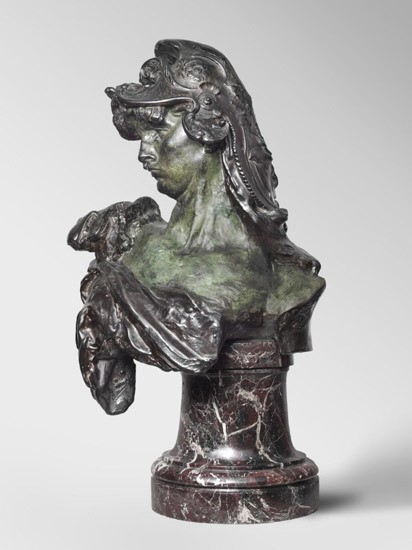 Rodin exhibits The Kiss and Monument to Balzac at the Paris Salon. 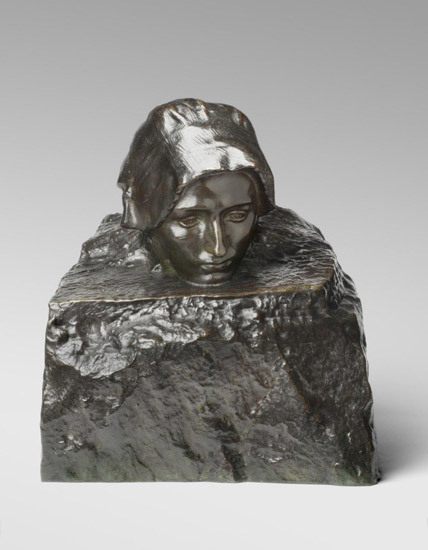 The Société des Gens de lettres de France refuses to accept the Balzac sculpture and a press campaign against Rodin erupts. Rodin enjoys his first major retrospective in May in a pavilion in the Place de l'Alma, in conjunction with the Paris Exposition Universelle. One hundred and fifty works are shown, cementing his international reputation. 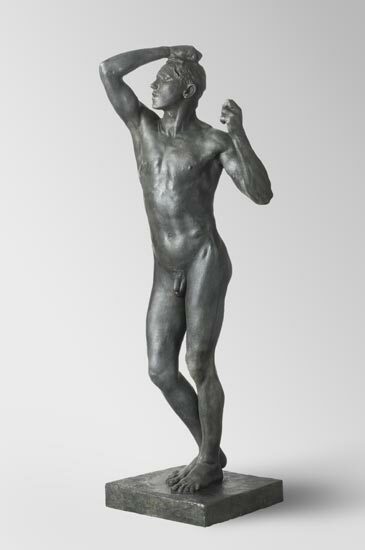 The firm of Alexis Rudier, established in 1874 and run by Alexis's son Eugène (French, 1878–1952), becomes Rodin's principal foundry. Twenty years later this same foundry, which casts bronzes using the sand cast method, creates most of the bronzes now in the collection of the Rodin Museum in Philadelphia. An enlarged version of The Thinker is shown at the Paris Salon to great fanfare. Two years later, a patinated plaster cast of The Thinker is placed in front of the Panthéon in Paris, which is replaced later that year with a bronze version. The artist purchases the ruins of the late seventeenth-century Château d'Issy and has the facade installed at Meudon. A replica of this gate acts as the entrance to the Rodin Museum in Philadelphia. As Rodin's health begins to fade, the idea of a museum dedicated to his work is proposed in Paris. Rodin publishes his studies on Gothic architecture as Les Cathédrales de France. The artist formally donates all of his work to the French government, to be placed in the future Musée Rodin. On January 29, just two weeks before her death, Rose Beuret and Rodin are married, primarily to safeguard his estate. Auguste Rodin dies on November 17 and is buried beside Rose under a cast of The Thinker at their home in Meudon, France. 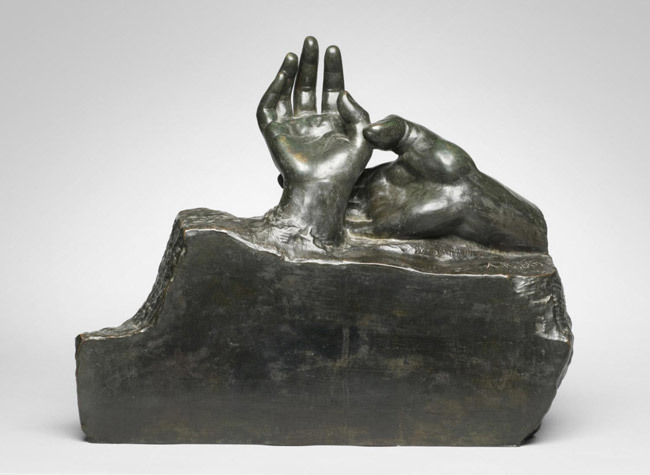 The Musée Rodin opens in Paris, just five years before Jules Mastbaum begins acquiring his collection of Rodin materials for the Rodin Museum in Philadelphia.